– A husband and his wife lie on a bed while fully clothed hug and kiss briefly. A man and a woman kiss briefly in a few scenes. An ill man wearing pajamas under bedcovers says he is cold and a second, clothed man gets under the covers and pats his hand; nothing sexual is implied. A man kisses a woman’s hand and then almost kisses a man’s hand, which he slaps away. ► We hear that a man has been married a few different times. A man runs his hand over his wife’s clothed thigh in a lounge and jokes that no one knows she is really a man. A man waves the end of his tie and smiles at a car containing four women. ► Two men judge a beauty contest where women stand on a stage in the background wearing one-piece swimsuits that reveal bare legs to the hips, shoulders and cleavage. Two women wear corsets and high heels, revealing full bare legs to the upper thighs, bare shoulders and cleavage. Two men wear kilts and knee socks, exposing bare knees. - An obese man breathes heavily and sweats, bends over, holds his chest and collapses; a man helps him up as the man groans and gasps, "Someone put the lights out," and is helped to his hotel room where a doctor tells the sick man that he had a mild heart attack and may have congestive heart failure, so he should retire from acting. A sick man coughs several times and says his heart can no longer take acting. A sick man returns to acting and behind a prop wall, he bends over, sweats and wipes his face with a handkerchief, but finishes the act without another heart attack. ► At a hotel a man loaded down with heavy suitcases makes a lot of banging noises as he struggles through the front door; at the front desk, another man slaps his hand away from the desk bell, the two men argue over the bell and one of the men struggles down a hallway, breathing heavily. Two men and two women argue rather loudly in a public place for several seconds as onlookers stare; the two men insult each other several times, and one man throws a beret at the other man who throws a piece of food into the back of the first man and the scene ends. ► In a hospital skit, a man lies in bed with one leg in a cast and in traction as another man accidentally lowers the traction weight into the sick man's head three times, causing a yelp, and then spills water over the patient's head. In two skits, we see a man lying in bed with a leg in a cast and in traction. A man pulls another man off stage by the back of his collar. In two scenes, a man follows another man onto a stage and hits the second man in the buttocks with his knee. A man slaps away another man's hand and hits him over the head with a small metal pan. One a stage, a man hits a singing man on the head with a hammer and the singer's voice becomes a much higher voice, after which the second man falls below the frame. An actor with a large sledge hammer tells another actor he will be tapped in the knee on cue; we do not see this, but the second actor limps in later scenes and says his knee hurts. In a comedy scene, a man hits another man over the head with a wooden staff, sending the victim into a creek; unharmed, the victim pulls a fish out of his garments and throws it away, making a disgusted sound. Two men push a heavy trunk up a long staircase and at the top landing, and the trunk slides to the bottom and lands with a loud thud. ► Two women argue in several scenes. Two men argue several times. On the deck of a cruise ship in cold weather a woman says a man is determined to catch pneumonia. A man shouts at two of his employees, belittling them. We hear that a woman punched a man in the mouth. A man jokingly threatens to wring another man's neck. Many voices in an angry audience complain about a show cancellation. A caption before end credits states that an actor died and his co-actor died eight years later. - A man tells a woman that he "takes all his tablets," a man takes a pill from a medicine bottle and swallows it with water, and two prescription bottles are shown on one nightstand and an amber medicine bottle on another nightstand. Several men sitting at a bar have mugs of beer or glasses of wine in front of them (two men sip beer and a man sips wine), glasses of wine are shown on tables in a restaurant and two men sip, two men each drink glasses of whiskey in a hotel room, a reception features glasses of champagne in the hands of many men and women and a few men and women sip from them, a man at a reception says about his wife "The more I drink, the drunker she gets," a woman grabs and drinks a glass of whiskey then grimaces and shudders, a wife tells her husband not to drink alcohol because it hurts him and he says he just wants to smell it, and a man tells a woman that he and another man no longer smoke or drink. Several men smoke cigarettes on a movie studio lot and one man smokes on a stage, a few men and women smoke cigarettes in an audience during three theater performances, men smoke in dressing rooms and hotel rooms as well as in a bar and a restaurant and an office and on a sidewalk, a man holds a long cigarette while on a movie set, a woman smokes a cigarette at home, a woman lights a cigarette and smokes in close-up, and a pack of cigarettes with a lighter and a full ashtray are shown on tables in several scenes. - Vaudeville, slapstick comedy, creativity, obesity, gambling, alcoholism, betrayal, jealousy, loneliness, lies, honesty, business, friendship, relationships, love, respect, teamwork, emotional support, conflict, reconciliation. 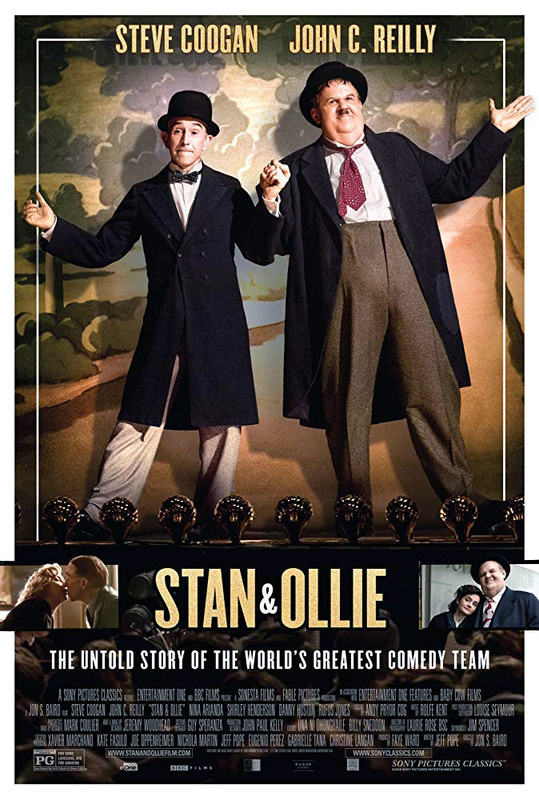 - Laurel and Hardy suffered hardships in their careers, but entertained millions and learned to cherish their friendship.